The Conti Motion is a premium brand all-season Sport Touring radial for the price conscious rider. Sport touring all-season radial with high-end performance at a lower price. 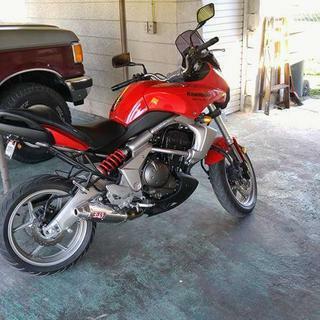 Ideal for entry-level riders and economic-minded veterans. Offers safe, reliable feedback on dry or wet roads. Formulated polymers in the compound deliver an impressive cost/mileage ratio. 0 degree steel-belt construction for improved stability and a smooth ride. Never had a Motion rear before. Cost was $99.00 WOW.....what a deal. I 'milked' out 9,100 miles out of that tire. More than I should have 'safely.' But- for the $$$$ what a deal. And this was on my PIG- a 2006 Honda ST1300 that weighs in at 740lbs. wet. Just bought another one....still at $99.00 HAPPY! This is great on an R1150RT! This is a great tire, and a better value. I put a set on my r1150rt at the beginning of the season, and had about 4k on them with minimal, even wear showing. Then a piece of ceramic tile road debris ruined the rear tire. Got another of the same as a replacement. Great handling, wearing tire at a great price. Will get this tire as long as it is available! Even though I have only put around 200 miles on this tire, the improvement from my previous is quite noticeable. Will only get this tire from now on. Tread life and grip are N/A as of right now because of newness of tire. Great tire at an amazing price! I have been using continental motion tires for the past 6 years and will ride nothing else! You can't beat the price! With over 30 yrs riding on the street, this was my first try with Continental. I put a set on my 15' Versys 650, although this is my daily commuter, I frequently find myself in the canyons on the week end, and I was blown away by the grip, and how hard I could push the bike. The Versys doesn't make much power, but it can carry speed, and these tires stick like nobody's business. They wear as expected, and handling was never in question, always smooth. A set was very cheap, throw in a rebate and its a steal. They replaced a set of PR3's and at half the price they were every bit as good... maybe better. I am a believer in the brand... might even try Conti Race tires on my R1 someday! Good tire. Haven’t got a lot of miles on it but handling is good. Seems ok haven’t had a lot of time on it we’ll see. Was a little slick at first but it’s getting better. I stayed away from this tire because Continental describe it as "ideal for entry level riders". A friend and I were out of state on a motorcycle trip when he noticed he had cords showing in his rear tire, he's a goober and didn't check tire before our trip. He had to go to local bike shop who only had this tire in stock. He had it installed with no other choice. We ride harder than we should on the street and this tire held up exceptionally well on his KTM Super duke 1290. Absolutely no issues in the dry, but was never tested in the wet stuff. If you're worried you'll outride this tire, I wouldn't worry about it. This is the third set that I have used. Very good tire. Good traction wet or dry. I have used these after two sets of Q3's and are just as good at any sane speeds. slips frequently in wet and cold giving me a much less secure feeling than previous or current tires. I did not have the confidence to push my bike hard with these tires as they would frequently slip in wet and cold. Cheap tires but not good if you like to lean or ride in all weather conditions. Replaced the Bridgestone that came on the bike after 4000 miles, it was wearing badly.... This Continental makes a great first impression! The handling of the bike changed dramatically and for the better. I ride 2up on typically good to very good surfaces and love the twisties. Have not been in wet conditions to make a judgement there, that's the only reason the rating isn't a 5. I commute about 75 miles a day. I have been using these tires for the past 5 or so years. I ride in the rain a lot and these tires do very well. I do recommend these tires. This was an excellent choice, great tire for the money. 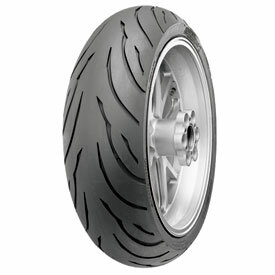 How do avoid being recommended a Harley tire instead of a sportbike tire? Before seeing this tire I was shown a Metzeler me888 for my 2002 Ninja ZX12R(like a gsxr 1000 on steroids) only because of size match. 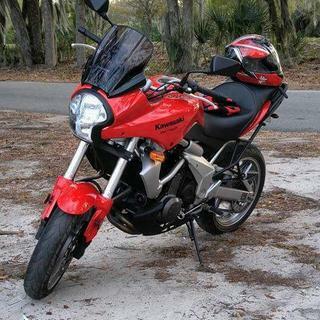 200mm wide back tires are NOT normal sportbike size rears and I need advice on how to tell which rear tires ARE. I go buy my owners manual but the manual recommendations are for long since discontinued tires like d208 dunlops and a bridgestone.